Getting the word out and capturing the attention of your attendees is never as straightforward as it should be, and the importance of event promotion increases by the day. 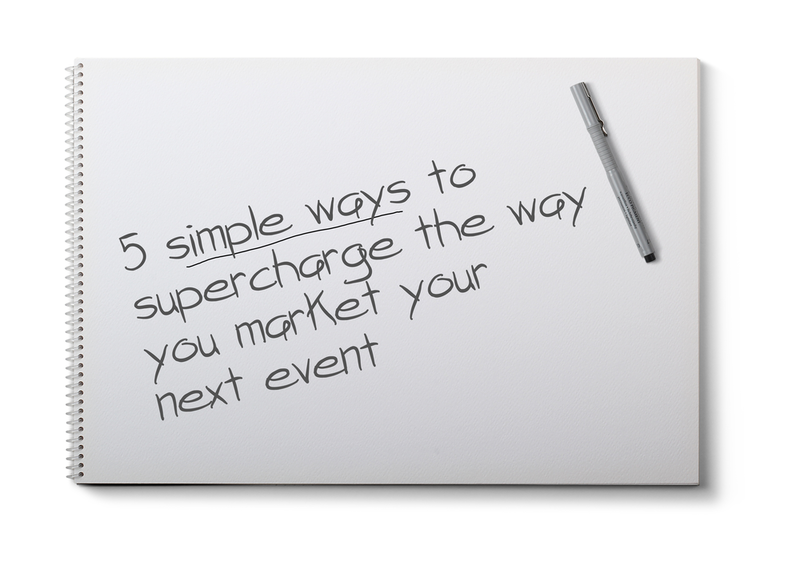 While competing for awareness, there are several useful hacks for marketing your event that can dramatically improve its success. You know this one – It's obvious. But it's my life's mission to stress the absolute importance of getting a head start. How early is too early? Earlier than you've been doing so far, trust me. Good things take time, and giving attendees the courtesy of planning ahead really does work. Protip; make the most of a Social Media Content Calendar – they're incredibly useful for planning event-related content ahead of time so you never miss a beat again. Don't just connect with your attendees; go deeper! So many event planners and marketers forget the various figures to engage. Converse with your delegates, make friends with the exhibitors, and become besties with the venue. They all want your event to be amazing, so make the most of it. One of my favourite ways of breaking the ice is through Twitter. Be sure to follow, retweet, DM – all to show your support. Remember: the more you give today, the more you'll get back tomorrow. Speaking of Twitter – what social media platform might be best for marketing your event? The trick is to analyse your audience. I'm talking age, gender, location, even income; all these factors determine where the party is. Here's my go-to infographic that covers the basics of social media demographics, which is invaluable for choosing where your word carries most weight. A word of wisdom: don't stretch yourself too far. It's better to master one social media platform than be average at five. Pin your most important event content to the top of your Twitter and Facebook – it will stay at the top of your page and be seen first by visitors. Use an event hashtag (#YourEvent17) to become even easier to find and engage with by everyone involved. Recycle and retrofit your best content – you've heard of #TBT right? What a great opportunity to reinforce your event's promotion. Consider the Rule of Seven which is the idea that prospects need to see your message at least seven times before taking action. Update your website banner and email signatures. Hey, every little bit helps, and these won't get bumped down social media feeds. Never forget one simple truth; people want to have fun at your event, and you know more than anyone what value you can provide to achieve this. Make sure your event has as much personality as you do, and I can guarantee that your event will be on the right track to success. Don't forget to do your homework – a great place to start is ShowGizmo's amazing webinar: Take the Risk Out of Your Event Social Media Strategy. It's here that you'll dive into social media for events and receive our top tips on eliminating risks from your events social strategy. Got any more hacks and ideas? Let me know! And I wish you the best of luck at your next event – I'm sure it will be a blast! Behind all of the technology and apps is a small but fiercely passionate team of professionals who are united by their love for the magic of events. In this brand new chit chat series we'll be sitting down with different members of the ShowGizmo team and getting to know them a little better. This week we're taking it to our Wellington office and chatting with the newest member of our customer success team. She left the world of banking for events and has her coffee with a hit of cinamon (we're not judging)...Meet Caitlyn! Q: Hey Caitlyn! Thanks so much for sitting down and chatting with me today...to kick this all off, tell us about an event you've been to that you loved? What was the magic that made you enjoy it so much? A: It would have to be talk about stroy telling I went to recently at Te Papa (National Museum of New Zealand). It featured three incredible speakers; one from Dream Works, one from Weta Workshop and one from Pik Pok. All the speakers had great visuals to help with their speeches and were from such interesting companies. It was a real eye-opener for me. Q: You're based in the Wellington office, so do tell us, what is the best part about living and working in Wellington, NZ? A: Has to be the coffee! There’s such a great coffee culture here. Unbelievably, we have more cafes per square kilometre than the New York City! I also love that it’s so compact you can walk everywhere! I walk to work every day and take in the views of the harbour. Q: So how do you like to have your coffee? A: Cappuccino with Cinamon. Doesn’t get much better than that! Q: What did you do before you joined the ShowGizmo team? A: I worked at at Westpac, as a customer banking consultant. Q: So you're used to working with people then? What is it about working with people that you enjoy/what do you think it is about working with people that makes you rock at it? A: I love talking to people — possibly a little too much sometimes! and getting to know them. One thing that I love about my job at ShowGizmo is being able to talk to our clients to understand what they are trying to achieve – this is always so different from event to event — and then helping them to succeed..
Q: What has been the most interesting/surprising thing you've learned about event planners since starting at ShowGizmo? A: The amount of detail that goes into events. Small things, like how to arrange tables or seats to make sure everything is perfect It's often easy to forget when you’re thinking about the more obvious aspects of events, but someone somewhere has to be making all these details, which combine to make a great experience, happen. Q: You're hosting a dinner party with 3 guests (dead or alive), who do you invite? A: This is a really hard one, but I've narrowed it down to Steve Jobs, Elon Musk and Ellen Degeneres. Think that would make a lively dinner paryt?. Dogs or Cats? 100% Dogs! Favourite holiday destination? I guess it can't say it's my favourite, because I haven't been there yet, but the dream is Iceland. Favourite ShowGizmo feature? Nested Schedules, they just make it look so good and help my clients with complicated schedules simplify and break them down - I think it really does create a better user experience for their attendees.